If you’ve ever lived with a cat, you probably laugh when you hear the old myth repeated that cats are “solitary” creatures who neither seek nor enjoy human companionship or the company of other cats. The myth persists despite story after story of cats following their humans to the bathroom, pushing their way onto their people’s computers or laps, spooning under the covers at night, snuggling with each other, or grooming their friends. Often it seems that people who have never lived with a cat buy into the myth — and not without reasonable cause. Some cats certainly take cover when visitors arrive at their door, so if a person has been exposed only to those hidey-cats the individual may well believe the myth. But that person is not seeing the cat or cats the rest of the time. Many cats will come right back out the nanosecond that the door closes behind the visitor or the cat sitter packs up and heads home… and go back to being their naturally social selves. On the other hand, a cat jumping up and down from your lap a dozen times in 10 minutes, and then walking across your computer another dozen hoping for a cuddle, is really not any less subtle than the exuberant lab greeting. Nor is the cat who sleeps on the pillow wrapped around her person’s head.And, anyone who, in a desperate attempt to gain a little more space in bed in the wee hours, has had to push back against the 10-pound cat who turned into a block of stone anchored to the mother ship during the night knows that a cat’s presence and demand for proximity can be awesome. Let’s face it, some people are extroverts, some are introverts; some people like other people and are well liked themselves, others would rather be alone. The same goes for dogs and cats too. 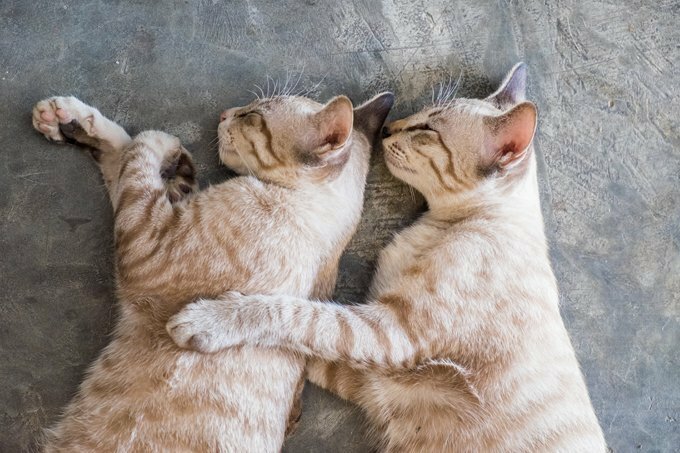 Some cats are life-long loners, or they may take 12 years to warm up to another cat, or they may be cuddling with the dog and grooming their sister cat from the get-go. Everyone has seen a host of adorable pictures on the internet of cats cozying up to other cats, cats playing with crows, cats mothering mice, and so on. It all comes down to the individual personality. If you have been a believer in the myth of the solitary cat, it might be fun to expose yourself to more cats in different situations and households to see just how sociable they can be.